The man in the Synagogue has had enough of being made a punch-line, it appears. 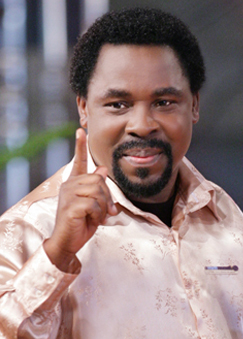 In an email sent by his team to journalists yesterday, the founder of the Synagogue Church of all Nations (SCOAN), Prophet TB Joshua denied a report by Leadership in which he regretted not foreseeing the death of his friend, the late president of Ghana, John Atta Mills. According to the purported statement titled ‘Leadership Stop This’, Joshua says he did not grant any interview to the Northern-based newspaper and has not made any public statement about the death. “The interview in LEADERSHIP NEWSPAPER of Thursday 26/7/2012 titled “I Did Not Foresee Atta Mills’ Death – T.B. Joshua” does not represent me, T.B. Joshua, because I was not around and I never spoke with anyone. “Once again, Leadership Newspaper Editorial Staff should please remove this interview for God’s sake! Don’t fight a prophet, don’t fight God! “Once again, readers, this is the first time I am talking to the public after the demise of our late president. I will talk as God instructs me on Sunday Live service on Emmanuel TV.